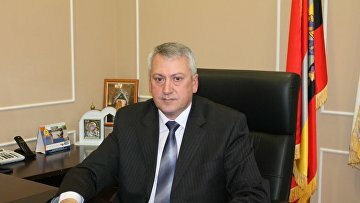 Former deputy governor of Russia’s Kursk Region sentenced to 2 years for corruption | Russian Legal Information Agency (RAPSI). MOSCOW, August 27 (RAPSI) – Ex-deputy governor of the Kursk Region Vasily Zubkov has been sentenced to 2 years in a high security penal colony for receiving a large-scale bribe, the press-service of the Investigative Committee has stated. Other defendant in the case, founder of the construction company Own apartment Alexander Filimonov has been sentenced also to 2 years. The company’s manager Natalya Kretova has been fined 500,000 rubles ($7,400). Former deputy chief of the Regional firefighting service Andrey Zanin has been sentenced to 2.5 years. Investigators found that in the autumn of 2015 Filimonov contacted Zubkov with Zanin acting as an intermediary. The businessman asked the official to provide his firm with an examination report allowing to commission a house in Kursk. In exchange, the official requested that a car garage evaluated at over one million rubles ($14,800), which served as a bribe, was registered in the name of his daughter. The documents were prepared by Kretova and transferred to a registration office. Earlier, Zubkov announced that he pleaded guilty and told the court that he had chronic illnesses requiring treatment.